Another Fire Under Construction Launches Another Investigation. Firefighters battled a four-alarm fire that destroyed an historic church in Milwaukee, Wisconsin. 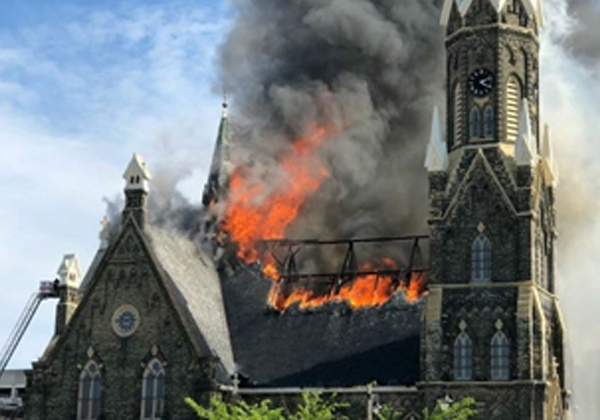 Officials told reporters that an investigation into the fire that ravaged the Trinity Evangelical Lutheran Church is ongoing, however, roofers had been at the site. Investigators have yet to conclusively link the fire to the roof work, however, the fire reportedly began in the roof. The fire Tuesday may mean one of the oldest churches in Milwaukee and the local Lutheran Church-Missouri Synod will have to be razed. During a conference call today, I was asked by one of the largest insurance companies risk management team what my opinion was on how all these fires are starting? My opinion was they are being intentionally lit on fire they are not job site mistakes.